Punks, New Romantics, goths, gangsters and club kids; in a relationship with British subculture that spans over 40 years, Derek Ridgers has seen – and snapped – the lot. But, it was the skinheads that really got him. 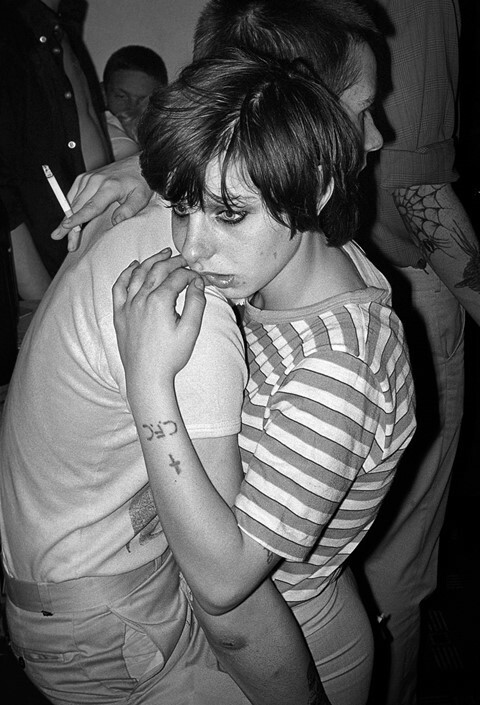 One night in 1979, the London photographer arrived at the notorious Billy’s nightclub, camera-in-hand, to document a group of New Romantics. Instead, upon his arrival, he found that they’d upped sticks and moved on – without thinking to tell him first. “In their place,” he recalls, “there were a lot of normal club kids and, as it turned out, a group of about half-a-dozen skinheads. They saw me photographing some of the other kids and one of them came over to me and said, ‘look why don’t you take some pictures of us?’” It led to an exhibition (aptly titled Skinhead) at the Chenil Studio gallery the following year – and kick-started a career that saw Ridgers capture Britain’s weird and wonderful social tribes unlike anyone before him. Now, in a new exhibition at Charlie Smith London, Ridgers’s photographs of young and beautiful kids from the scene will appear alongside oil paintings by the artist Sam Jackson. Titled Run To Me, the show – curated by Faye Dowling – illuminates the tales and transgressions of British youth, bringing together the respective works in a way that is both provocative and poignant. It also marks the first time that the photograph “Stoke Newington, 1981” will appear in a Ridgers exhibition. To mark the show’s opening on October 13, we asked the photographer to tell us the story behind the image’s creation. Below, he discusses what drew him to the couple depicted in the picture, how he ended up at the North London house party in which it was taken and why, after all these years, the “Stoke Newington, 1981” has resurfaced. “I’d photographed the skinheads from the spring (of) 79 to around October 1980. I’d had a show in Chelsea of that work in the summer of 1980 and it brought a whole load of people into my world; quite a few other photographers got in touch with me – Nick Knight, Iain McKell, Richard Allen, the film director Mary Harron. It was all down to that show in 1980. In the early part of 1981, I met someone who worked for Rolling Stone and she eventually commissioned me to take some pictures for them of the skinhead scene in London. So, I did that in June – it was a very intensive period of me finding the skinheads and following them around. It was really Rolling Stone that got me to go to that party in Stoke Newington. So, I met up with a group of skinheads in a pub prior to the party – I don’t think we were there very long – and we walked from the pub to the party. Halfway there, some of the skinheads that I was moving along with didn’t seem to know who I was. There was a bit of a hairy moment, but I got saved by a quite well-known guy who came over and said ‘he’s okay, he’s with us.’ After that, everyone was as good as gold. I was at the party for a couple hours and everyone was very polite and friendly. It might have been a squat, though it could have been someone’s house for all I know. Either way, I’d noticed this girl there who was very small, very young – but very pretty. She had these big dark eyes. I had photographed her a couple of times before I did this image, but I saw her with her arms around this guy; she had her head on his shoulder. I saw this look and I stepped in a little bit and crouched down so I could get in close. I was using a Nikon FM at that point. Just quite a simple camera – it’s really only got a shutter speed and aperture on it. That’s probably the only photograph that I remember taking from that party. The rest of it is a bit of a blur. I was there and the kids at the party were ignoring me – I was wallpaper to them. That’s perfect for what I’m looking for, they just allowed me to there. That’s a great place to be if you’re a photographer, if people don’t notice you. With the skinheads, once they accepted me – or a few of them accepted me and the others just went along – they just basically ignored me, unless I spoke to them, or I wanted to take one aside to do a portrait or something. But there were some very beautiful faces among the skinheads. That must have been part of my thought process – why I wanted to photograph (this couple) in the first place. There were some great looking kids. I suppose I must have spoken to certainly the girl at one point, but I honestly don’t remember what I said. I didn’t get anyone’s names from that night – there seemed to be too many people at this part and it didn’t seem to be feasible. Although, I do (now) know one of the guys that I photographed (that night), because I’ve since met his daughter who was, until she graduated in the summer, a student photographer. He’s in one of the photographs, certainly. She says her dad doesn’t remember too much about the party either! One of the things about most of my photos – almost all of them – is that there isn’t much of a backstory. What you see is the story and I quite like it like that. I don’t want to have to explain my photographs – especially not of the skinheads. I want people to look at the photographs and everything they get from it is what they see. It takes me a long time to like my own work. But I do like this, I must say. At the time, I didn’t really notice it. It wasn’t until (my) book The Others came out that I really even thought about it much. I’ve got tens of thousands – probably hundreds of thousands – scans here of my photos, but it was just one that I didn’t really think about that much. After a couple of decades, I’ve come round to liking some of the photographs I’ve taken.